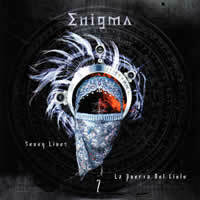 The highly anticipated new album from Enigma (the project of Romanian producer Michael Cretu), "Seven Lives Many Faces", arrives to the masses on September 19, 2008. Unfortunately, for a Canadian like myself, I have to wait until the end of the month. In the meantime, however, I can certainly take a look at the first (and perhaps only) single from the album. But wait! It's actually a double A-side single: "La Puerta del Cielo" and "Seven Lives", both of which will also be on the next album. Enigma's previous works have always been about embracing the sounds of various cultures. On his debut album, MCMXC A.D., from 1990, there was a heavy focus on Gregorian chants and shakuhachi flutes while maintaining a certain electronic music standard. By the end of the decade, there had been a shift to more operatic accompaniment, evident in 1999's "The Screen Behind The Mirror". The later more pop-oriented sound of "Voyageur" in 2003 were overtaken by the space odyssey of "A Posteriori" three years later. Now, in 2008, new influences are already arising. Cretu himself has referred to the upcoming album as "omni-cultural", and that may very well be the case. La Puerta del Cielo features the well-aged vocals of Margarita Roig (yes, I have never heard of her either). Combining her Spanish lyrics, beats that allow us to reminisce about the early days of Enigma, and euphorically haunting pads, this is an interesting track that is both uplifting yet relaxing at the same time. Cretu generally sticks with a small, selective bunch of vocalists but for the first time, he is reaching out beyond the usual roster. This is proving to be beneficial because now he can get a much broader spectrum of vocal expression and realize the full potential of his tracks, such as in this one. On the flipside, we have Seven Lives, which has actually been the track that grabs my attention. Using sharp jabs of strings, unprecedented beatboxing (at least for Enigma) and a flute, Cretu has created an energetic and empowering song that pretty much anyone can happily jam to. I had mentioned that new vocalists are good to have; in this case, classic singers can be just as effective. Andru Donalds, who has supplied his voice for the Enigma project for many years, delivers what may be perhaps his most powerful performance yet. His voice bears a strong force which adds even more power to the track. I like this one over "La Puerta del Cielo", but both songs have their own merit. There is a stark contrast between the music presented here and that of the previous album. "A Posteriori" was actually a bit more sterile, and perhaps it was intended to be that way. Enigma's new material has more humanity and heart to it, something that most listeners should be able to appreciate. I look forward to hearing the next album in its entirety soon, but if you're like me and can't wait, this single should suffice for the time being.